A Barbie-sized version of Boy George. Very popular with Culture Club fans! The following are links about Boy George Doll you may find interesting. Also check out the other pages. Some out of the box close up photos of the Boy George doll. The following are comments left about Boy George Doll from site visitors such as yourself. They are not spell checked or reviewed for accuracy. George you and culture club have been the best Rock Band of the 80's I also don't under stand why people hated you that makes me mad . but your songs really tuched me . Hagan, you're the only one on here who makes sense! I never even knew there was such a thing until now. The doll looks more like Dorothea from the Golden Girls. 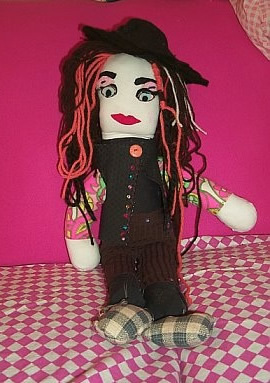 Perhaps one of the most gay dolls ever two be made, lol, we love you boy george. Long live the 80s. My daughter had a Boy George Doll years ago, and I sold it in a garage sale when she tired of playing with it. She is now 32 and has never let me live this down. I feel so guilty and a terrible Mother, if only I could get her another one. in1984 me and my sister Stacy we went To See Boy George and Culture club rite after we Graduated from High and sr. High. I have gone to alot of his concerts and I've Lernt a lot more about music and fashions and fads and wearing Make up and there music had very good under standing and meanings to. we should do things rite and not wrong, and I 'm glad he changed his ways! I'm also glad in 1984 they were trying to help Etheopia and rais Money to help them Boy George did come from a very Strict family his family are Irsh cathlic and moved to England.his His pa was A Boxer and A biulder his ma ma is A House wife and A Nurce . George was Borne 6/14/1961 and his favorit Artist was David Bowie. I won a Boy George doll on eBay late last year. It looks exactly like him!! Made me become a BIG fan of his!! I really will just that doll.. do you sell them? I look it a long time for it.. cant find it. I have a boy George doll but it's not this one it's the soft bodied bigger one! Anyone know where I could have it valued please? hello. if someone sells the ragdoll let me know please. thank you.